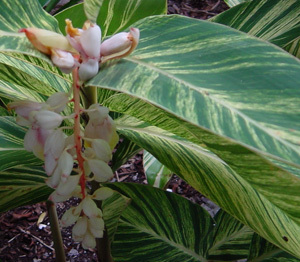 Alpinia Ginger leaves have a wonderful aroma when brushed up against. They are popular, not only with home gardeners, but they are sought after as cut flowers by designers for hotels and other venues. A. purpurata Ginger is native to Malaya. They do best in full sun to produce the large 8 inch long torch shaped blooms that are long lasting in the garden. They also make a very good potted plant. A. zerumbet is native to China. 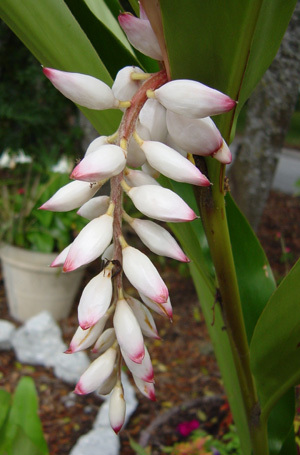 The blooms look like a series of small shells that give it the common name shell ginger. Propagation is by division. This one also comes in a variegated version with beautiful nature designed leaves.